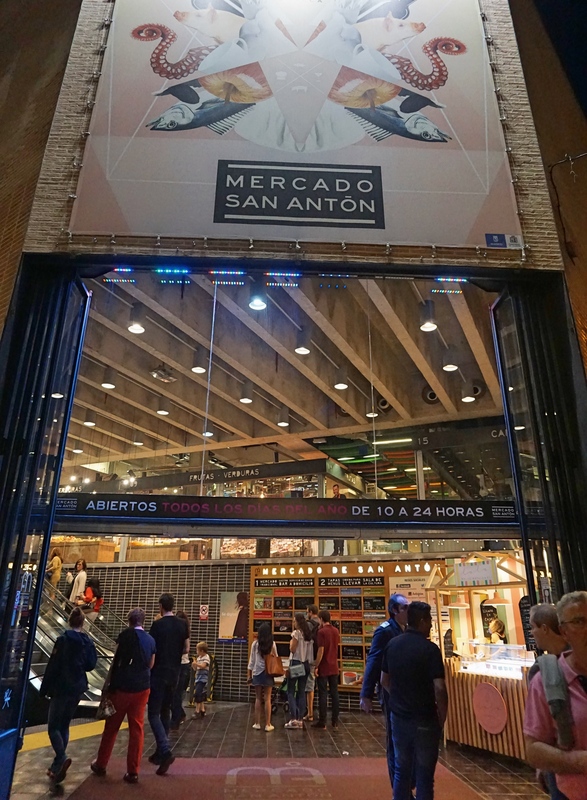 Mercado de San Antón in Madrid is not much of a tourist place. Locals frequent this market, not only for fruits and vegetables, meat and fish to make a meal at home, but also to chill out and enjoy the atmosphere, enjoy some wine with food to match. Head to the first floor and that’s what you’ll find. On the ground floor there are fishmongers, butchers, fruit stalls, and the like. The terrace on the top floor offers romantic city views, with a restaurant aptly called La Cocina de San Antón. But the best part, for me, was the floor in between. Tapas without end, to be taken away or consumed on the spot, at standing tables along the sides with a view of all the other floors filled with food in this very open space. The market has existed for more than ten years – the conservation of traditional flavours (conservar el sabor tradicional) as its main objective. The bustling crowd drew us in and we found ourselves ordering a few pinchos here, a few there, collecting little parcels of perfection before we gathered them all at the only small table corner still left (far too small for three people) in this busy place. We chin-chinned with a cool, refreshing glass of white wine, and tucked in. The combination was nothing short of divine. But what exactly are those foods you call pinchos? – you may ask. Well, pinchos may be described as small appetizers that are skewered onto a slice of bread. Note, however, that there are pinchos with no bread whatsoever. The Gilda, for example, is a pincho with only olive, anchovy, and pepper. Note also, that some would consider the words pinchos and tapas as interchangeable. It’s a matter of semantics: in Northern Spain (provinces such as Asturias, Cantabria, and Navarra) any small portions of food had with drinks are most often called pinchos, whereas these are called tapas in the more southern parts of the country. I would argue that tapas usually need tools to be eaten, whereas pinchos are mouthfuls on a slice of bread. They mostly consist of one or very few ingredients, as opposed to tapas, which can be smaller portions of a main dish. You can read more about the world of tapas here. Pinchos ingredients may include local cheese with fig, a piece of Spanish omelette, anchovies, a slice of ham – the possibilities are endless! And it comes as no surprise that pinchos are particularly popular in Northern Spain, since this is where they originate. It was in the Basque Country where the invention of pinchos occurred. 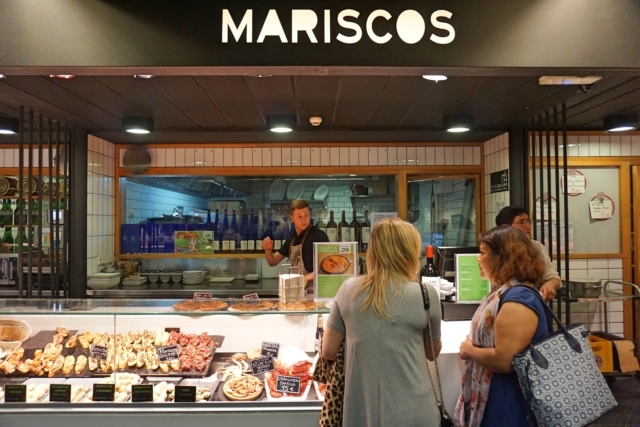 This autonomous community of northern Spain is famous for its cuisine. A cuisine, which has lived through a gastronomic revolution, led by Juan Mari Arzak and Pedro Subijana; the first Spanish restaurant to be awarded three Michelin stars (Zalacaín); and a large number of appreciators in the form of gastronomic tourists (yes, we do love eating too). Pinchos, or pintxos as written in the País Vasco, were invented in the 1930s in the coastal city of San Sebastián. The restaurant La Espiga, close to the beach (Playa de la Concha), became popular due to the unusual appetizers offered there. Customers could find these miniature portions displayed at the bar, take a plate, and serve themselves. To keep them together they were speared with wooden cocktail sticks or toothpicks. The trend spread to other restaurants, and in the 1940s to other Basque cities as well (Pamplona, Bilbao, etc.). 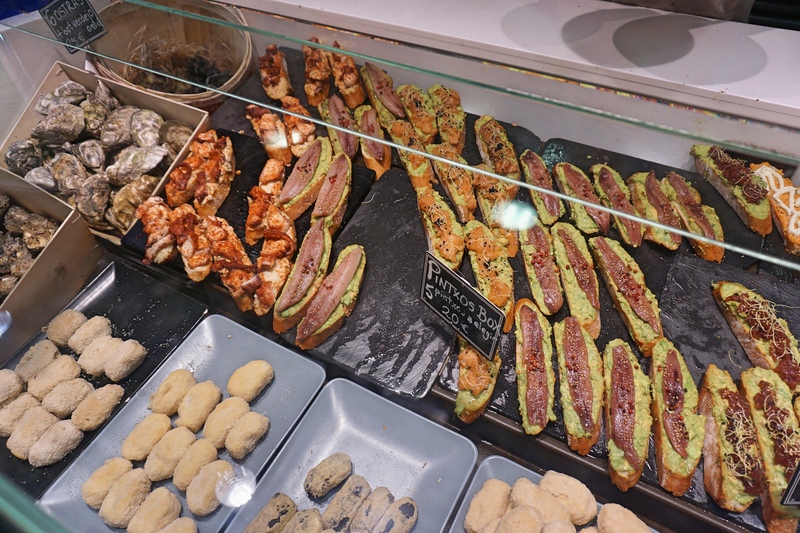 In many pintxo bars in Spain today you can still help yourself to these tasty bites and leave your sticks on the table for the waiter or bar tender to count and tally your bill. Now there’s a clue as to how pinchos got their name: in Spanish pinchar means “to pierce.” Cocktail sticks are pierced through the food on the slice of bread to hold it in place. Nowadays, however, these sticks are often left out, with only the name left to remind us of how this food’s journey began. One of the pioneers to have pushed the development of tapas and pinchos to yet another direction, that of serving them as elaborate aperitifs or starters in a fine-dining restaurant, is Catalan chef Ferrán Adrià of the elBulli restaurant. 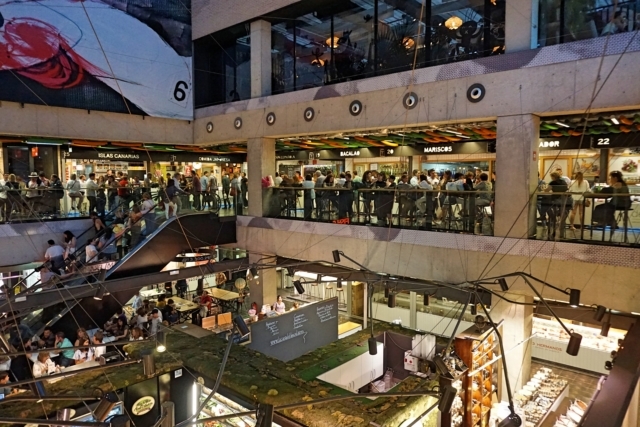 In Pamplona there is even La Semana del Pintxo, a week in which the plethora of pintxo varieties are celebrated through a competition between restaurants of the area. But pintxos are also still enjoyed casually, as a meal or as part of a drinking spree. In the País Vasco Spaniards will ir de pintxos rather than ir de tapas, both essentially the same thing: to make their rounds having drinks with small portions of food in more than just one bar. And in the same vein, txikiteo refers to the Basque version of a pub crawl. 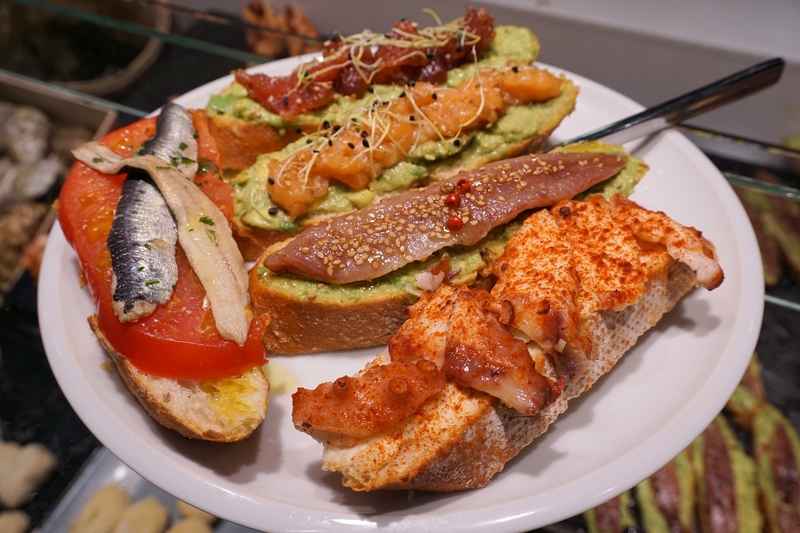 The tapas, or pintxos, are not just sustenance, but a way to socialize and disconnect from the daily routine. It’s a commensal practice with a heavy focus on food and drink that is ingrained in Spanish culture. It’s not just food, but a way of life. I’ll chin-chin to that.